We evaluate the performance of the low-cost seismic sensors Raspberry Shake to identify and monitor rock fall activity in alpine environments. The test area is a slope adjacent to the Great Aletsch glacier in the Swiss Alps, i.e. the Moosfluh deep-seated instability, which has recently undergone a critical acceleration phase. A local seismic network composed of three Raspberry Shakes was deployed starting from May 2017, in order to record rock fall activity and its relation with the progressive rock slope degradation potentially leading to a large rock-slope failure. Here we present a first assessment of the seismic data acquired from our network after a monitoring period of 1-year. We show that our network performed well during the whole duration of the experiment, including the winter period in severe alpine conditions, and that the seismic data acquired allowed to clearly discriminate between rock falls and other events. This work provides also general information on the potential use of such low-cost sensors in environmental seismology. FIGURE 1: (left) Map of the area of investigation with indication of the location of the three RS seismic station installed starting from May 2017. (a-c) Pictures of the RS installation (a, RS-1; b, RS-2; c, RS-3). Continuous records of seismic signals on the 3 stations are available since beginning of July 2017. In this work we show the performance of a network of three Raspberry Shakes during a 1-year pilot project aimed at testing such low-cost seismic sensors (developed for home-use) to study rock fall activity in alpine environments. Our results highlight that, despite installation on the rock surface and only moderate protection from the expected harsh environmental conditions, the Raspberry Shake seismometers provided continuously waveforms during the 1-year observation period, without any further intervention after the installation. Continuous seismic monitoring for rock fall detection is of high relevance in alpine areas, where the use of other instruments can be hindered due to environmental conditions, logistics, and/or high/costs. 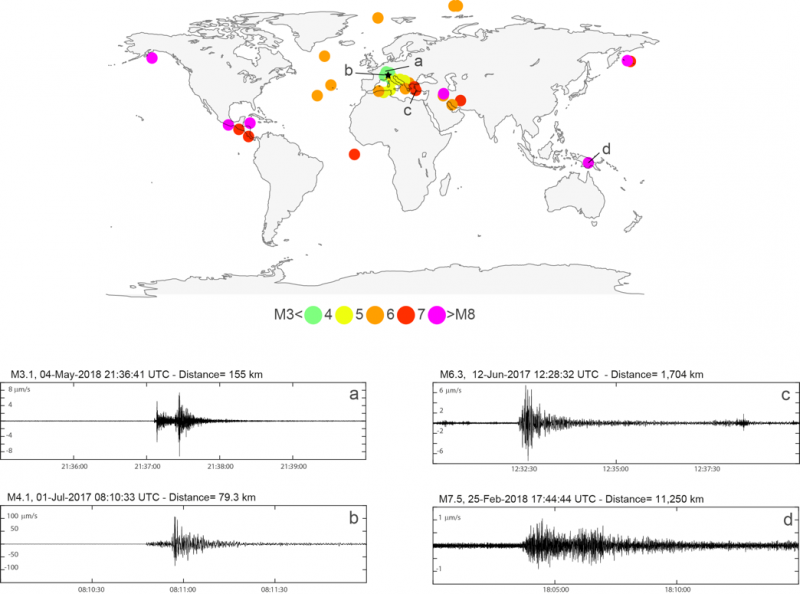 We show also that low background noise levels at our Raspberry Shake stations allowed for detection of local, regional and distant earthquakes, as well as large mass wasting at relatively large distances. Currently, visual interpretation of the waveform properties in time and frequency domains allowed to discriminate between rock fall events associated with the evolution of the slope instability, e.g., rock fall phenomena of different size and run out, and seismic events, such as regional earthquakes and teleseisms. Future work is aimed at developing automatic detection and discrimination, as well as at attempting location of seismic signals due to rock falls. During the design of this pilot study, we aimed at retrieving the number of rock fall events occurred and use the event amplitudes and duration as proxy to classify their size. However, as demonstrated in this work, the performance of the Raspberry Shake in alpine environment look better than expected, and the use of higher sampling rates, as well as 3D ground velocity records instead of 1D vertical components only, might further enhance the capacity of better describing rock fall events. We thus foresee that due to their performances and low-cost, Raspberry Shakes will be more and more adopted also in research studies. FIGURE 3: Performance of the RS-1 station in recording earthquakes. (top) Spatial distribution of earthquake events identified in the RS-1 waveforms out of a catalogue of 64 earthquakes occurred within 1-year time period at distances up to 15,000 km. (a-d) Examples of seismic signal recorded by RS-1 associated to earthquakes of different magnitudes and occurred at increasing distances from the monitoring station. Signals are band-pass filtered (Butterworth, 2nd order) between 0.5 and 15 Hz. 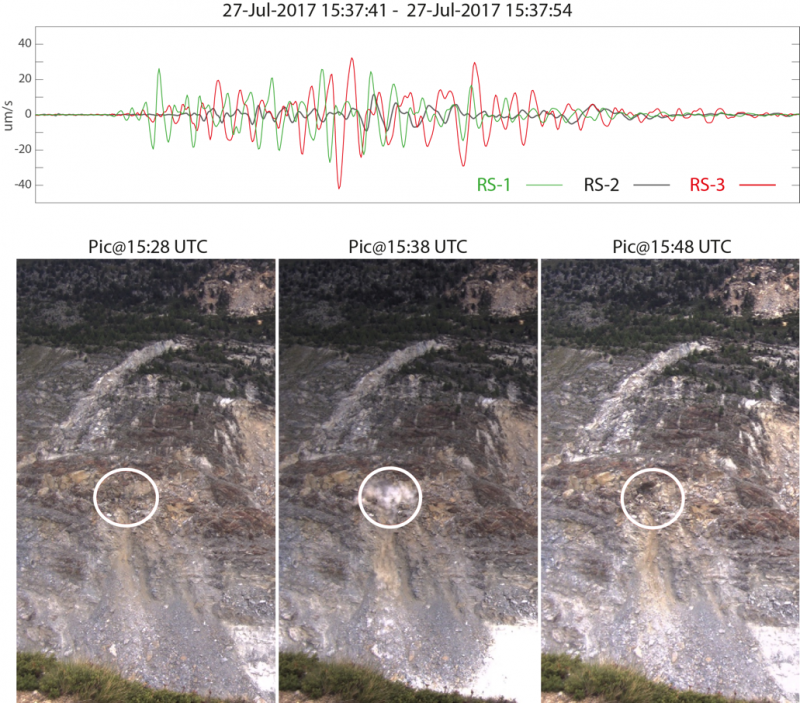 FIGURE 5: Detail of a rock fall event occurred on July 27, 2017 around 15:37 UTC. (Top) Seismic signal is clearly visible at the three RS stations. Note the differences in amplitudes and phases. (Bottom) Three snapshots with 10 minutes baseline acquired by the webcam. The rock fall event is clearly visible (white circle). Future work will jointly exploit seismic and optical images to locate and characterize rock fall events. Click here to view the complete paper from Andrea Manconi et al. and published in Earth Surface Dynamics (ESD). Supplementary information from the study can be found in the ESD repository here. From all of us at Raspberry Shake a special thanks to Andrea Manconi et al. for conducting this study and writing this article.